QUESTION: Is it only coincidental, or is there something deeper behind it? Something like "as the subjunctive often expresses uncertainty, let's make the verbs sound weird by deliberately using a wrong set of endings to emphasize that we are not sure"? It's clear that nowadays the endings are just inherited from the language history, but is there any theory about the origin of this particular coincidence? PIE had two different moods to express things that are not real: subjunctive (non-factual or depending on a condition) and optative (wish). Italic languages (among which, Latin) merged both functions into one. The new Latin subjunctive mood was (normally) constructed using the optative forms, leaving what was the PIE subjunctive to express future now. For some reason (which I haven't found), the optative thematic vowel -i- was replaced by an -a- in Italo-Celtic languages. This is speculation, but I feel like all five Latin conjugations would have had an -a- thematic vowel for the subjunctive... If it weren't for the first indicative already having one. The way this was resolved was using -e- for the first conjugation and I guess some standard euphony rule took place there. Of the five Latin conjugations, we inherited just three (like in Catalan, French and Italian; others, like Romansh and Romanian, kept four). I must insist, I'm not a linguist and haven't dug deeply in the linked documentation; but, as requested in the above comments, this may serve as a starting point to discuss. Not the answer you're looking for? Browse other questions tagged gramática subjuntivo conjugación historia or ask your own question. What am I doing when I use the subjunctive? Would the subjunctive be used in “Si cada persona aprenda uno de las lenguas”? 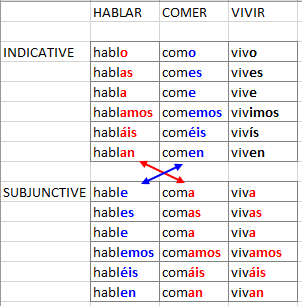 What's the root for present subjunctive conjugation?